CAM metabolism - Crassulacean Acid Metabolism - a metabolic adaptation allowing temporary storage of carbon-dioxide as organic acids (e.g. malate) and later release of carbon-dioxide, by decarboxylation of these acids, for fixation into sugars. This allows uptake of carbon-dioxide during the cool nights, when water loss by transpiration is relatively low, while providing a store of carbon-dioxide for photosynthesis during the day. CAM metabolism is typical of Agaves, Cactaceae, Crassulaceae. Tropical grasses use a similar C4 pathway to support high rates of growth under optimum conditions. Carotenoid - Carotene - a class of violet to orange or yellow fat-soluble unsaturated hydrocarbon pigments, usually with 9 conjugated double bonds, found in most higher plants and responsible for the colour of carrots, squashes and sweet potatoes. Carotene assists photosynthesis by transmitting energy from absorbed light to chlorophyll. Cataphyll - a poorly developed, often thickened leaf whose primary function is other than photosynthesis. e.g. cotyledon, scale leaf. In Cycads, cataphylls protect the apical meristem and are often produced prior to the emergence of leaves or cones. Cell - the basic structual unit, which may be capable of replication or differentiation, from which all living tissues are made. Hence adj. cellular made from cells. Algal cell walls contain cellulose and glycoproteins and a variety of other polysaccharides including alginic acid and sulphonated polysaccharides. Diatoms synthesise distinctive crystalline silica cell walls from orthosilicic acid. 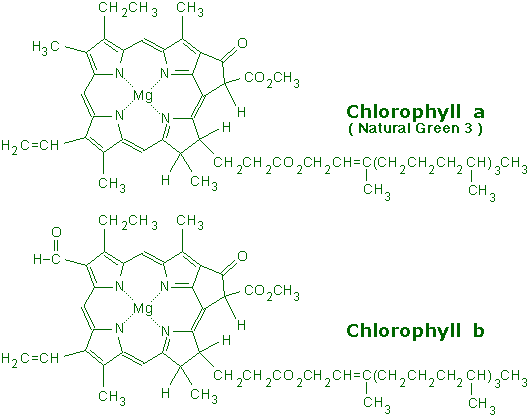 Chitin - may be the second most abundant polysaccharide in nature, after cellulose to which it is structurally related, but see also lignin. At least 109 tons of chitin are thought to be synthesised each year. Chitin is found in the cell walls of many lower plants such as yeast, mushrooms and other fungi. It also forms a substantial part of the exoskeleton shells of crustaceans, such as crabs shrimps and lobsters, as well as in the exoskeletons of marine zoo-plankton, including coepods, and in corals and jellyfish. Insects, such as butterflies and ladybird beetles, have chitin in their wings. Cochineal - a red anthroquinone dye (carminic acid) made from a domesticated scale insect ( Dactylopius coccus) and related species that live on prickly pear cacti (Opuntia species). Carminic acid is produced by the scale insect as an effective repellent for other insects such as ants. This dyestuff was used in pre-Hispanic Mexico for dying textiles. Although superceded by synthetic aniline dyes such as alizarin from the 1870's onwards, cochineal is still an important food colourant and used for dying textiles in folk art. Carmine is a precipitated form of cochineal. Colliculate - covered with small, rounded or hill-like elevations ( colliculae) e.g. surface of seeds. Coma a tuft of hair, usually terminal, especially on a seed tip. A tuft of leaves or bracts. Compost decomposed vegetation, used to improve the soil in gardens. Concolourous - coloured uniformly throughout, the same colour on both sides. . Creation - most cultures subscribe to a legend that the earth or universe was created in a relatively short period of time by a supernatural power, together with all existing species (presumably including the Cactaceae and all other succulent plants). Cycasin - a toxic glycoside - methylazoxymethanolß-D-glucopyranoside - found only in Cycads.